As the interactive narrative community continues to mature, discussions are beginning in which we debate the relative merits of differing methodologies, discuss priorities around classes of problems and look at epistemological questions that arise from what we perceive as limitations of our work. Horswill’s Science Considered Harmful initiated a conversation around the role of science in the advancement of knowledge in our field, putting forward the idea that a scientific mindset restricts our ability to progress. In this paper, I respond, arguing that science, and more generally scientific rigor and the kind of results that it produces, are well served by a discourse that makes productive distinctions between such things as science and not science. 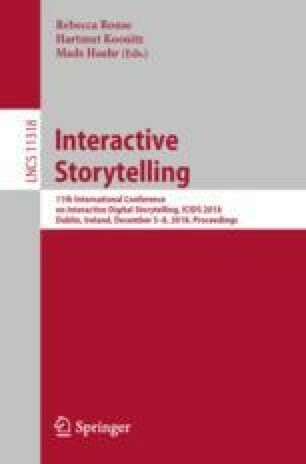 In particular, I argue that such a thing as a science of narrative exists, that scientific work is an important way to advance our knowledge of computational models of narrative and that scholarly practice around interactive narrative research does not need to be viewed as only scientific or as only artistic/aesthetic. This material is based upon work supported in whole or in part with funding from the Laboratory for Analytic Sciences (LAS). Any opinions, findings, conclusions, or recommendations expressed in this material are those of the author and do not necessarily reflect the views of the LAS and/or any agency or entity of the United States Government.